Career Mentorship is the key to smart & clear thoughts in students & it is great time to engage B.sc students in career information. How should I go about enrolling in for B.sc Mentorship counselling plan ? What is the duration for mentorship for B.sc students ? The duration of mentorship is for 1 year from date of enrollment i.e till the students is in B.sc. How is year round mentorship is done for B.sc students? Mentorship is all about overall development and confidence building and career planning of the students. A B.sc students undergoing mentorship will be exposed to various knowledge, activity and practical work life which is usually not given in schools, colleges or in tutions. Various important 21st century skills are inculcated in the students through various video talks, sessions and interactive assignments. 12 sessions will be done with students and parents where actionable assignments are shared. Year around mentorship will focus on building important life skills – initiativeness, communication, Confidence, Overall Personality Team work , motivation and self management. Who are mentors for the mentorship plan for B.sc students? 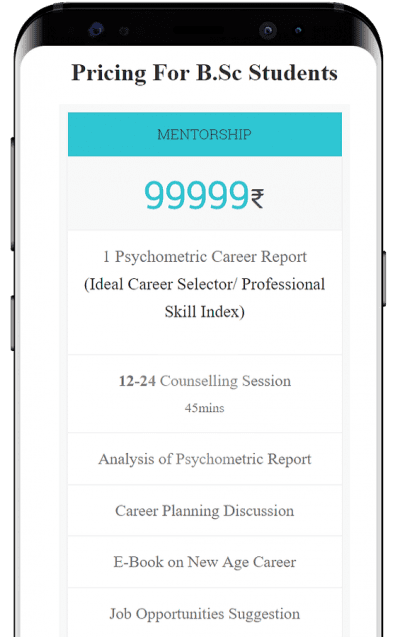 Do you offer discounts for meritorious students of B.sc on mentorship plan ? Do you have EMI options for pricing package on mentorship for B.sc ?